Welcome to today's edition of Nerd Alert, where we have all the eccentric, nerdy news for you in one convenient spot. What do we have in store for you on this wonderful Wednesday? Game of Thrones gets a hypnotic trance remix, you can raise a glass to Heisenberg with new Breaking Bad vodka, a DIY craftsman makes a flamethrowing ukulele inspired by Mad Max: Fury Road and much more. So, sit back, relax, and check out all that today's Nerd Alert has to offer. One of last month's Nerd Alert columns featured a story about a Breaking Bad themed bar that is opening up in London this summer. Blue Ice Vodka is taking things to another level with their own Breaking Bad Heisenberg vodka, which will be available this summer. 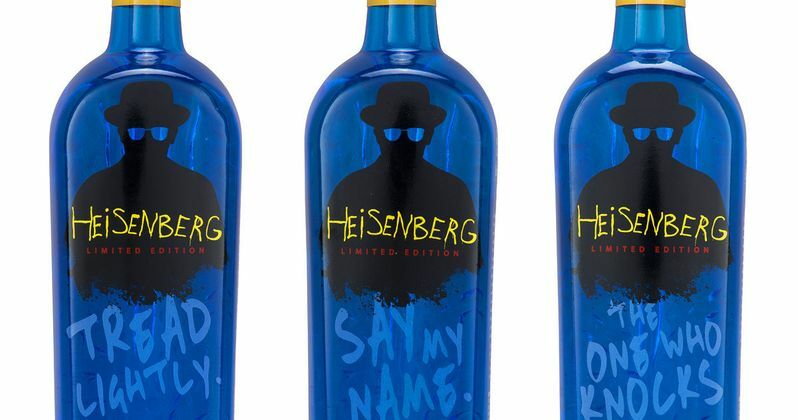 We're not sure how much these bottles will cost, but Blue Ice is releasing three collectible bottles featuring classic Breaking Bad lines "The One Who Knocks," "Say My Name" and "Tread Lightly." Series creator Vince Gilligan also offered his own endorsement, stating, "I'm counting on our fans to use it in the creation of a great many delicious cocktails. I'm getting thirsty just thinking about it." With just one more episode left of Game of Thrones Season 5, fans are going to have to find new ways to get that Westeros fix they need. World-renowned DJ Armin van Buuren has given fans a new twist on Ramin Djawadi's classic theme song with a trance remix. It's a hypnotic 4-minute track that is certainly inventive, even for those who aren't big fans of electronic dance music (EDM). It'd be interesting to see how this remix would work with the /game-thrones-musical-dinklage-coldplay-red-nose-day/Game of Thrones musical from NBC's Red Nose Day. As a part of their Weekend Projects video series, Make decided to build a much smaller version of Coma the Doof Warrior's flamethrowing guitar in Mad Max: Fury Road, with a flamethrowing ukulele. The four-minute video above gives you a step-by-step process on how to make this unique musical instrument yourself, using simple items you can find at any hardware store. The same process can also be used for any standard guitar, but make sure you follow the video's safety instructions because, you know, it is a flamethrower. Laser Unicorns, the production company behind the hit 30-minute short film Kung Fury, put together a clever four-minute video featuring Hackerman (Leopold Nilsson), who puts together a step-by-step video of how to hack time, using hilariously out-dated equipment. After watching the video, which ends with a twist, fans can visit VHX.tv to find out how you can win some Kung Fury prizes. With Jurassic World hitting theaters in just two short days, it's a perfect time for the Screen Junkies crew to deliver an honest trailer for Jurassic Park's less-than-beloved sequel, 1997's The Lost World: Jurassic Park. We already showed you everything wrong with Jurassic Park 2 last week, but given the amount of hatred for the sequel, it seems like the right time to pile on. The Washington Post held a recent survey to compare net favorability ratings for candidates in next year's Presidential election, to several iconic movie characters. The results (probably) shouldn't surprise you, with The Terminator, Star Wars' Darth Vader and even the shark from Jaws landing the top three spots. The only candidate with a favorable rating was Bernie Sanders, and even Harry Potter's Voldemort ranked higher than real contenders such as Mike Huckabee and Donald Trump, who finished dead last. Who's ready for Election Year now? Fright Rags is putting out yet another collection of Child's Play t-shirts and merchandise, following their initial run earlier this year. This collection will focus on the sequels Child's Play 2, Child's Play 3, Bride Of Chucky and Seed of Chucky. The shirts will cost $27.00 apiece, and you can pre-order then through the Fright Rags website, with orders set to ship in late July. Simon Koay has found a way to make learning the alphabet for kids fun by creating Superbet, a typographic exploration of alphabet design by reimagining each letter of the alphabet as everyone's favorite superheroes and supervillains. Each letter has been created with inspiration from characters who share that same initial in their name. Fans can purchase the artwork at Society6.com/SimonKoay/Prints, and check out the full list of superheroes in this Superbet.